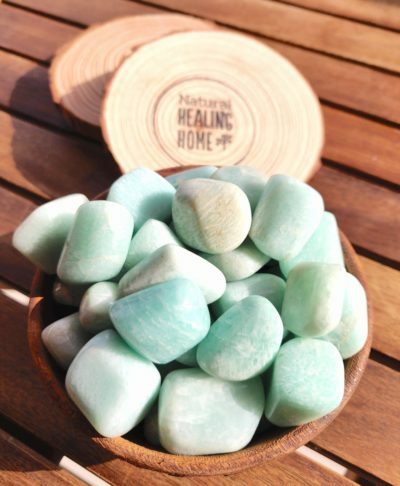 Amazonite is a good crystal to help channel energy into a positive and constructive direction. Our collection of Amazonite is a beautiful turquoise / sea green color. Amazonite is the stone of courage. Back in the 10th century it was used on the shields of women warriors. Also use Amazonite to push others to help with more chores at home and tidiness with children (or adults; whoever needs it more : )). Colors: Blue-green or turquoise to darker greens with white lines, opaque. Physical benefits: Known to help with Breast problems, passages f the throat, thyroid gland, never and neurological connections, upper spine, recovery after illness and to maintain health and a healthy lifestyle. Emotional benefits: Helps increase self respect especially in women. Reduces self neglect attitude. Also allows to channel free floating anger into positive action. At the workplace: Helps to keep you in the right place at the right time for the right opportunities. Best for: When you need a sudden burst of luck or prosperity. Affirmation: I expect fair treatment and consideration from others. Blue-green or turquoise to darker greens with white lines, opaque.